Why would you need to make an entry door repair? What do people see when they walk up to your home? It is usually your front door. Do you really want them to see a sign saying Front Door Broken – Use Side Door? Most of the time there is no need for that. Entrance door repairs can be made without too much difficulty. This article will discuss some common problems that occur with front doors. There are both visual and operational concerns with an entrance door. Visually, you may need to paint or caulk some items that need attention. You want your door to open and close correctly, the locks to provide security and the weatherstripping to keep the heat or cold out. These features can be addressed without replacing the door. Read on and evaluate what you need to do, to make your own entry door repair. That depends on who you talk to. 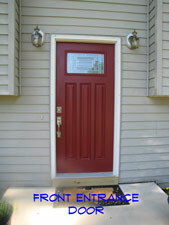 Many websites and companies will equate an entry door repair with front door replacement. A decent off the shelf pre-hung entrance door will run from $250 to $600. High end doors can run into the thousands of dollars. It will cost another $150 to $250 to have it installed, assuming there are no problems. You may be fortunate and find a carpenter that will repair the door and be honest with you. Minimum it will involve a service call, around $50 plus any parts. This would be to adjust the door or weatherstripping. You will need to be the judge on whether or not you want to be sold a new door. So you could save from $50 to $850. The lower figure is for something that might take you fifteen minutes to accomplish. The range of tasks we are talking about start with simple adjustments on up to removing and replacing a section of the door jamb. Replacing your door is a subject for another website. Over time doors get out of adjustment, this will cause them to sag and not close correctly. The common culprit is the top hinge. Check the adjustment on the door before you do anything. Weatherstripping, either replacing or adjusting is another simple fix. The alignment on the strike plate can also cause the lock not to work. Worst case, you take the door out and cannot get it put back in. Your entry door repair problem has escalated. This will leave you with a big hole in the front of your house. You can put plywood over it temporarily. You can also make things worse if you start adjusting things the wrong way. A sticking door could turn into a door that won't close at all. Make sure you understand what you are trying to accomplish before you do anything. The steps below give you instructions for adjusting a door. This would also include dealing with a sticking door. Wood doors can swell and stick. Does the door stick every year during the rainy season? If it does, planing or sanding it may solve the problem. Most of the time, a sticking door needs to be adjusted. This is especially true if it is the upper strike side that is sticking. Is it the door lock or deadbolt that is not working? Locks and deadbolts have their own set of problems. See the article on 'Door Lock Repair', for information on adjusting, repairing and replacing door locks. Another common reason that locks don't work right is a door that is not adjusted properly. When the locks don't align with the strike plates, the won't lock or won't stay locked. See the article 'Adjusting Exterior Doors' and 'Adjusting Door Locks to Strikes' for more information. Is the door leaking air or can you see daylight around it? You need to repair or replace the weatherstripping. See the article on 'Weatherstripping for Doors', for more information. Doors can leak both cold and heat out of them. You can save yourself some money by keeping it in good repair. Is your door jamb or door frame in need of repair? Is it cracked or split? It is also possible to have rotten wood near the base. The steps and info you need are found in the article 'Door Frame Repair'. Find out what you can do to repair the door frame without replacing the door. Entry door problems will normally be associated with three key areas. The alignment of the door, the hinges and the hardware that is attached to the door. Read below to determine where your problem lies and the select the appropriate link. Is the door hard to close or open. Try to determine where the friction is occurring. There are two spots that take the prize most of the time: (1) The upper corner on the latch side of the door (the side with the door knob). (2) The bottom of the door, again on the latch side. Both of these conditions indicate that the door is sagging. Over time the weight of the door pulls on the top hinge and loosens it up. See the article 'Adjusting Exterior Doors' for instructions on tightening the top hinge and checking the door for alignment. This is a very common entry door repair problem. Humidity can make a wooden door swell in the summer, causing it not to close. If this is a persistent problem, you can sand or plane the door to take enough material off the door so that it will close. Caution should be used when doing this. Later, in the winter, the door will shrink and may result in a gap if too much wood is removed. Are you sure the door is swelling? This is only going to be true if it is an all wood door and it is not sealed very well. Check the margins first before you start sanding or planing a door. See the article 'Sanding and Planing a Door' for instructions on sanding or planing a wood door. Another entry door problem is when the door is hard to move even when it is not going into the frame? Are the hinges squeaking or making noise? The hinges may be binding up. See the articles, 'Lubricating Door Hinges' and 'Replacing Door Hinges' for instructions and information on what to do with door hinges. Hopefully, you have been able to get your entrance door working properly. Learning how to adjust a door is a handy thing to know. Doors will often act up. Many of the same principles apply with all doors. Getting the weatherstripping right is important when it gets cold. For swinging doors, remember that the top hinge is doing all the heavy lifting. With a little patience you have been able to make your own entry door repair. Congratulations, not everyone can do this!